More than a hundred powder specialists from all over the world gathered at the Romaco and MG2 Powder Conference in Bologna/Italy on September 13 and 14, 2016. Technologies for manufacturing, processing and dosing pharmaceutical powders were spotlighted and discussed in more than twenty presentations and several machine demonstrations. Visitors to the two-day event were invited to the various sessions at Romaco S.r.l. and MG2, both based in the outskirts of Bologna. Later in the evening, all the conference participants got together in the vineyards of the Colli Bolognesi to review and exchange the day’s experiences in a magnificent setting. The jointly organised Powder Conference 2016 is the latest milestone in the successful partnership between Romaco and MG2. The two manufacturers took the opportunity to showcase themselves to industry professionals as providers of complementary technologies for processing the same dosage form: on the one hand with Romaco-built microdosing machines, tablet presses and granulation and coating systems and on the other with MG2’s capsule fillers. Romaco Macofar is a supplier of solutions for aseptic and non-aseptic dosing of pharmaceutical powders and an established player in the global pharmaceutical markets since the seventies. 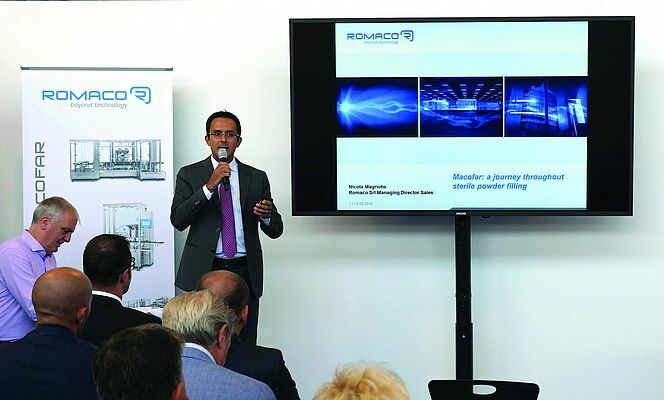 The Romaco Macofar powder portfolio goes hand in hand with Romaco Kilian tableting solutions as well as Romaco Innojet’s expertise in the granulation and coating of pharmaceutical solids.